Students gathered in the Curb Event Center Saturday night for high-energy, guitar-driven performances from a handful of Belmont’s most talented rock musicians at Rock Showcase 2017. The showcase started off with Sam Johnston’s upbeat, blues-rock sound. Fans gathered around the stage early into the set to dance, helping Johnston keep his performance both fun and engaging. Johnston was confident on stage and proved his talent with his soulful, bluesy voice and expert guitar playing. His second song slowed things down, but for his final song — a cover of “Roses” by OutKast — Johnston got the whole crowd dancing and continued the psychedelic, blues-rock feel of his set. The next band to take the stage was The Thing With Feathers, who picked up the energy that Johnston had garnered during his opening performance. The band played as fans surrounded the stage and danced to their mixed, classic rock style. The Feathers trio appeared comfortable and happy on stage, and made it clear they were having just as good of a time as the audience at the front of the stage. The band calmed things down briefly for the last song of their set — a cover of “Little Black Submarines” by The Black Keys. During the song’s softer opening, Feathers’ frontman David Welcsh sat down at the end of the stage to sit among the fans. When the song picked back up and moved into the closing solo piece, the band seamlessly kicked it back into high gear and closed their exciting set on a high note. The female trio of Group Nap took to the stage next, bringing a more pop-rock sound to the show. Group Nap’s style was reminiscent of St. Vincent, and brought a fun, eclectic type of rock to the showcase. Bassist Connor Novello also brought an interesting, fun addition to the mix — especially when frontwoman and Group Nap bassist Emma Lambiase picked up her bass and played with him. But dual bassists weren’t the only unique thing Group Nap brought to the table. Lambiase was undoubtedly confident and kept the crowd dancing and singing along with her. Before starting their final song, Lambiase took a moment to acknowledge the band’s activist platform and spoke about sexual assault in the music industry and on college campuses. Lambiase then led the band into their final song, which ended the performance on just as much of a high note as they’d started. As crew members set up for Parrotfish’s closing set, more and more fans moved toward the front of the stage. 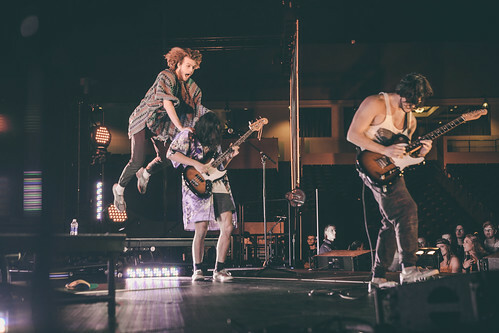 The band — noticeably without lead singer Conor Lynch — took to the stage and began playing their cover of Red Hot Chili Peppers’ “Can’t Stop.” Lynch soon made his big entrance — jumping over bassist Matthew Rodriguez onto the stage. The entrance — followed closely by a somewhat terrifying fall — was the greatest indication of what the band’s set would look like. Parrotfish kept up the hyper-energized stage antics during the rest of their performance, with Lynch and Co. jumping and dancing around on stage to a locked in, funk rock sound. The band’s whole set — brimming over with a contagious, funky energy — was a captivating end to the show, and earned the band the showcase win. Review written by Caroline Cathey. Photos by Olivia Amaral and Shelby Thacker.